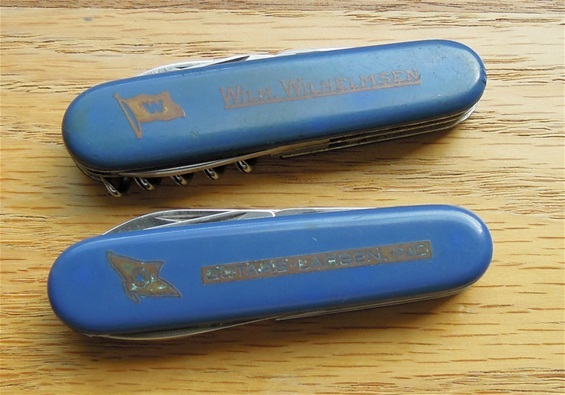 Here are two interesting Victorinox knives with inlays for two shipping companies. I do believe these two are made for this with the inlays. I will talk some about these knives and the knife on the top is a Victoria stamped knife that probably is from the mid-1960s. It got +Pat can opener and other details that make the mid-1960s the best date. 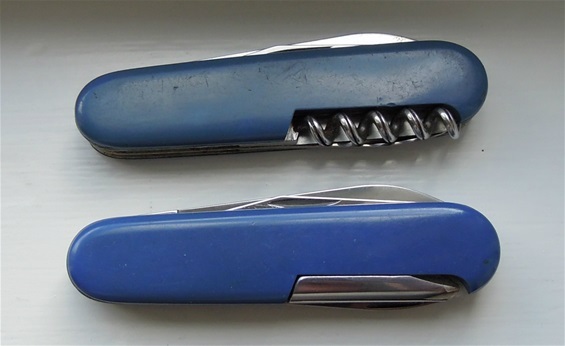 Both are 84mm category knives and the top knife got a corkscrew and the other Philips with file. The shipping companies are Wilh. 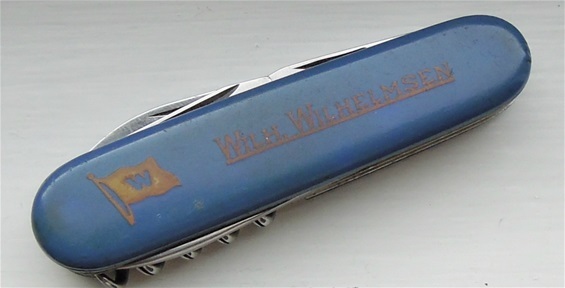 Wilhelmsen and Gotaas-Larsen Inc. Both related to Norway. The Gotaas-Larsen knife is from around 1970+- because it got no +Pat and some other factors. 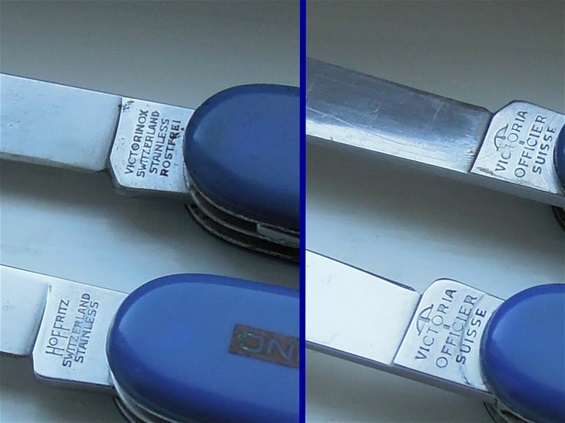 It is also stamped Hoffritz and also Victoria on the blade. 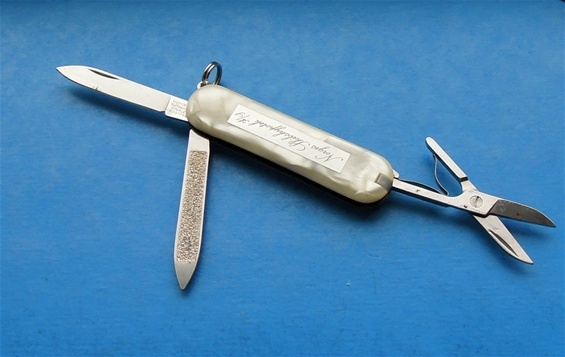 It is a real Victorinox made knife for the Hoffritz Company. Remember about the backside Victoria on knives, this is important! On the picture to the right you can see the old file phillips and corkscrew. Both knives got the cable scraper tool on the flat screwdriver with cable stripper/bender. PS about the inlays. It is a bit difficult to see the text on the pictures becasue of the patina developed. Many times it is nickel-silver but i would believe there are other materials used at this time in history too. On the picture below you can see the tang stamps on both sides. 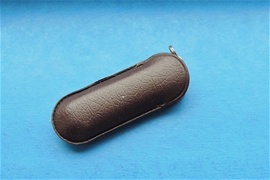 Brown holder that is common to find on Victorinox knives in history. 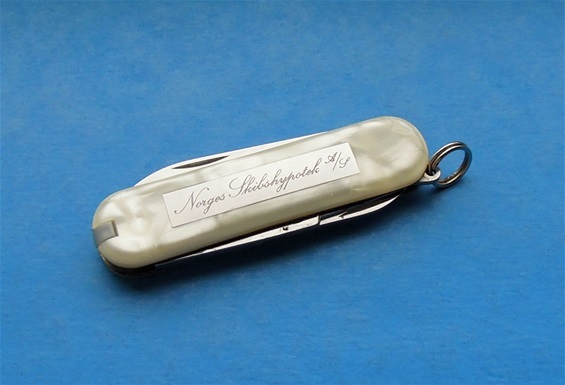 Here is one more maritime SAK and this is a 58mm Victorinox Classic with imitation Mother of pearl Cellidor. The inlay reads Norges Skibshypotek AS that is an important Company in Norway. There are a few history lines to be found on the internet. The Inlay is stainless steel and the liners are nickel silver at least the different darker tint would suggest so. There are a few spots on the steel but nothing that affect and the mechanism and functionality are completely intact. It is in good condition for sure. It got toothpick and tweezers in the handle scales. The Classic needed a good cleaning and some oil and now it is a little beauty. The small spots on the functions I will not do anything about. The little holder is made of a plastic type material that is common to see on Classic and 84mm knives in the history; also on more categories it is used. So what is the date of manufacture on this knife? I would not be surprised if it is very early 1980s. It is always an extra bonus that the holder is with the knife. It is the same as a knife with the original box. This is so because the knife came originally with and therefor the little extra. The drawback is that it is a bit difficult to know if this particular holder is original to the knife. It is not a solid holder but it will last if care is taken. It will protect the handle scales from scratching and protect against dirt. There are variations on them and as you see on the picture there is not much difference between them. For the 58mm Classic you will find that some holders are a bit more narrow and tight. The material and construction of the holder are almost the same for the 84mm only longer. It is a plastic imitation material. 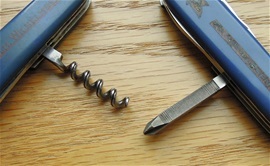 Sometimes this holder is an indication for special models made by Victorinox. Sometimes knives came without a box and only the holder and this is done even today. 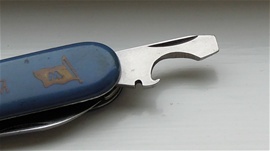 PS if other Readers on SAKhome.com have any vintage knives for sale to Marko then feel free to use my webpage for such. 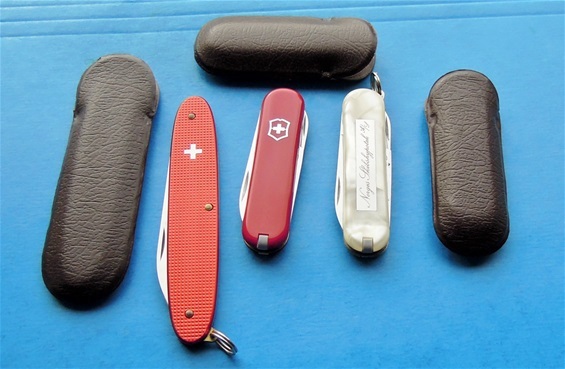 Hi, any vintage Victorinox or Wenger knives for sale perhaps? Thanks.